“Those kids were outstanding,” said Jim Spinale, and he would be a good judge of that topic. The retired middle school science teacher spent decades working with South Shore kids on days just like this one. 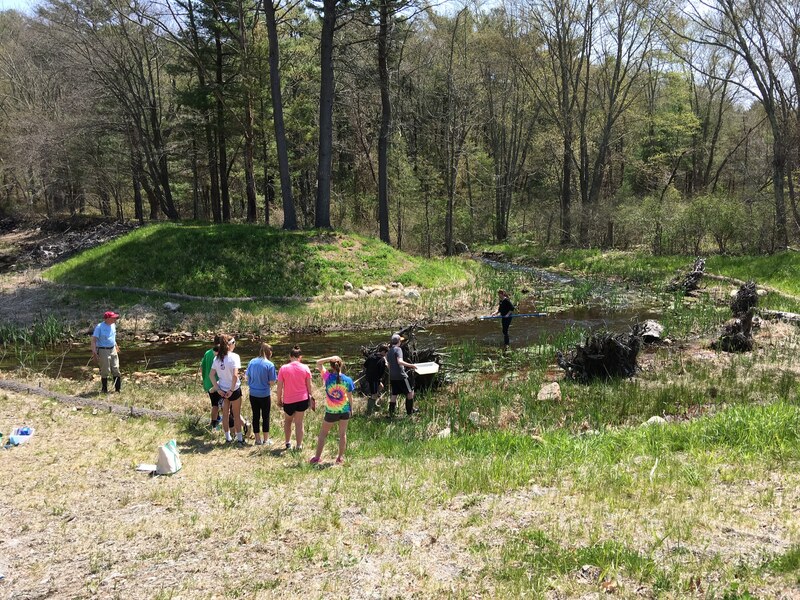 On Thursday, May 12, approximately 50 students from the Hanover Middle School joined naturalists and volunteers from the South Shore Natural Science Center for their initial foray into the world of water quality testing. The sixth and seventh graders broke into five separate groups and headed to five separate sites along Third Herring Brook in Hanover. 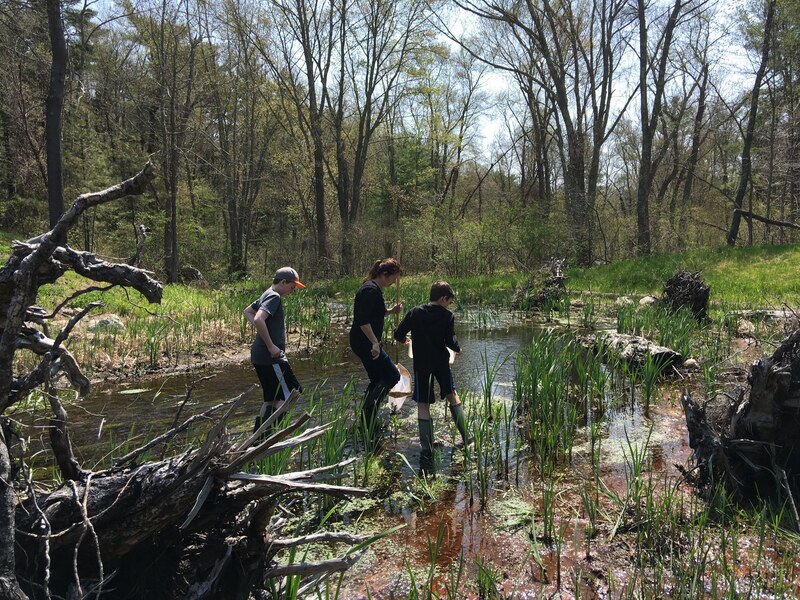 At each site the kids took different measurements – on turbidity, conductivity, salinity, ph, and dissolved oxygen – before focusing on macroinvertebrate sampling. Retreating to the Science Center, they compared results, gaining a greater picture of life in the brook ecosystem. Speaking of which, they found lots of it: scuds, dragon fly larvae, mayfly nymphs, orb snails, fingernail clams, predacious diving beetles, crayfish, toad and bullfrog tadpoles and even river herring. The students then returned to school, knowing they had data to crunch and a final report to deliver together. Thursday’s water quality testing program served as the first step in a multi-stage program funded by Battelle. After this spring’s students are done, students from the Germantown Neighborhood Center in Quincy will take up the study in the summer before a new, third wave of Hanover Middle School students will repeat the studies in the fall. 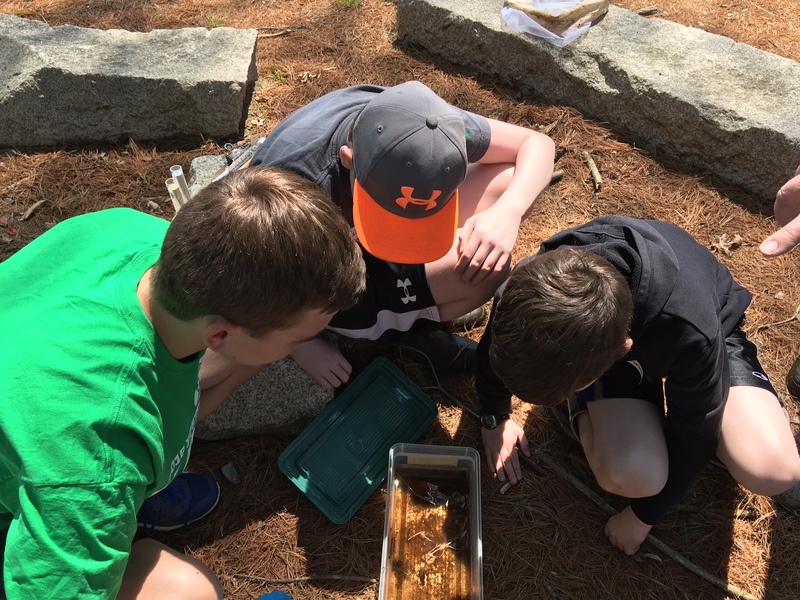 The entire program, a partnership between Battelle, the South Shore YMCA and the North and South Rivers Watershed Association, is introducing approximately 150 students to the concept of citizen science, and the idea that their data is just as valuable as anybody else’s!